Fused through hard labor and organized crime, the Midwest metropolis of ChiLo teeters between dream and nightmare. As a megalopolis, ChiLo represents infinite opportunities for the souls wandering its streets, but someone is always watching, and where there is desperation, there is profit to be made. 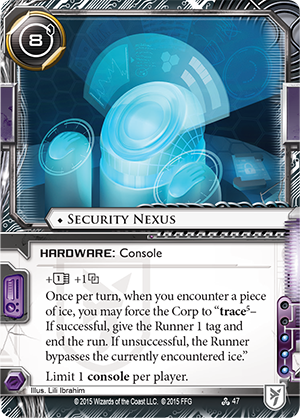 Reign and Reverie, the final expansion for Android: Netrunner: The Card Game, is available now! 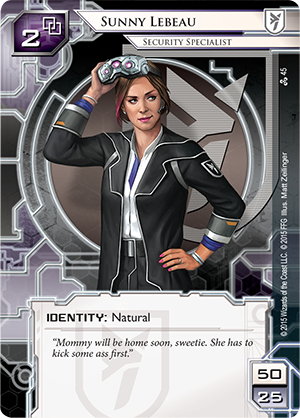 Reign and Reverie contains new cards for every faction in the game and is a celebration of all things Android: Netrunner. Look for new identities, agendas, consoles, and more to greatly change the game and provide new deckbuilding options for every player. 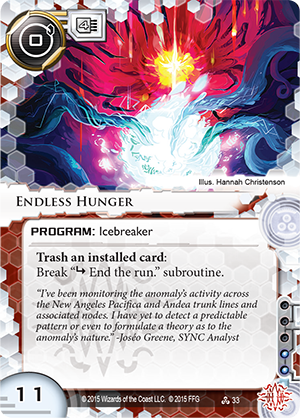 First introduced in Data and Destiny, Apex (Data and Destiny, 29), Sunny Lebeau (Data and Destiny, 45), and Adam (Data and Destiny, 37) introduced a fresh new way to play Android: Netrunner through the use of their own mini-factions. Over the last several cycles, these mini-factions have received additional support and they each gain one final card in Reign and Reverie. 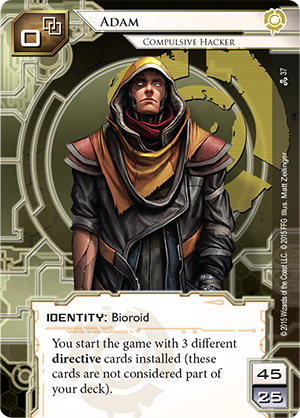 The rogue bioroid Adam is trapped between two worlds: his need to adhere to his directives and his drive to break free. Algernon (Reign and Reverie, 22) is a new program that represents a similar quandary. It allows you to pay two credits to gain a click at the beginning of your turn. While the ability to gain a click can be powerful, Algernon comes with a restriction. 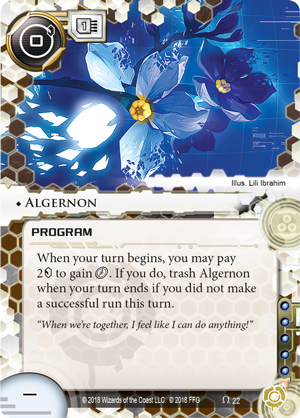 If you did not make a successful run on your extra-click turn, you must trash Algernon. Still, you always have the choice to take the extra click, meaning if you aren’t in position to make a successful run, you can simply choose to take a normal turn. Like Adam, you must walk a careful line with Algernon—it can make your turns incredibly efficient, and with careful use, the program can lead to victory. Sunny Lebeau is not your typical runner. With corporate backing, Sunny tests a corporation's defensive structures. Running is quite literally her job. 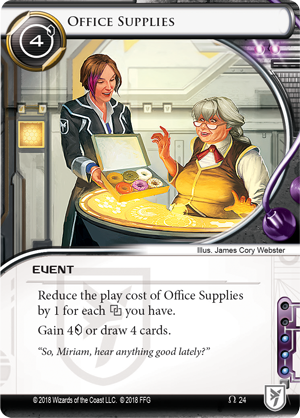 Office Supplies (Reign and Reverie, 24) is an expensive four-cost event, but it can be purchased at a discount equal to your link, and it also offers you a powerful choice: draw four cards or gain four credits. As the only Runner with two natural link, Sunny is already able to play Office Supplies with a worthwhile discount, and if her link is boosted by cards like Security Nexus (Data and Destiny, 47), Office Supplies becomes even better. If you manage to find yourself at four link, Office Supplies becomes a free windfall of cards or credits! Like Sunny, Office Supplies may seem innocuous, but it can become one of the most powerful events in the game with proper planning. Apex dwells in the darkest areas of cyber space. Consuming data indiscriminately, he is a tall tale runners tell each other in the dark… and he is coming for you. 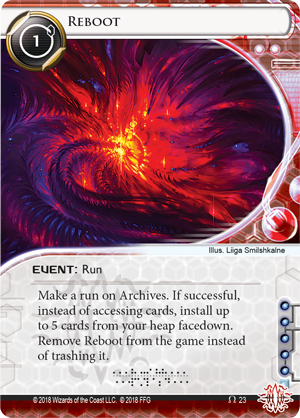 Reboot (Reign and Reverie, 23) is a new one-cost event for the runner that lets you make a run on Archives, and if successful, you can install up to five cards from your heap facedown instead of accessing cards. 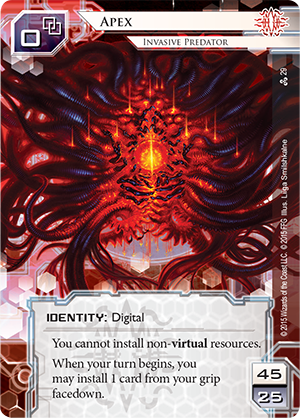 Apex feeds on raw data, and while these facedown cards do nothing on their own, they are food for cards like Endless Hunger (Data and Destiny, 33), or they can be repurposed with Assimilator (Sovereign Sight, 8). Either way, these cards fuel Apex, and the more raw data he has at his disposal, the more powerful he becomes. While the Midwest is full of orgcrime and people looking to escape, it is also a bastion of entertainment. Sportsmetal (Reign and Reverie, 26) is a new HB identity focusing in on the high-impact world of sports. When you choose Sportsmetal as your identity, you gain two credits or two cards whenever an agenda is scored or stolen, giving you a refund when you score an agenda and taking the sting out of having one stolen. Even when the runner achieves their goal, they're just setting you up for your next big play. This effect is even more potent if new agenda Hyperloop Extension (Reign and Reverie, 27) is the target. Whenever this agenda is scored or stolen, the corp gains three credits. In other words, if you score it, you gain back all the credits you spent to advance it, plus an extra bonus if Sportsmetal is your identity. Conversely, if Hyperloop Extension is stolen from Sportsmetal, you receive a massive credit and card windfall while the Runner receives a single agenda point. 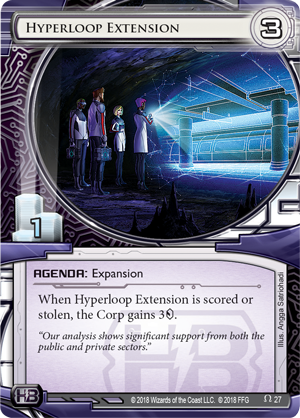 Hyperloop Extension is the best kind of agenda: one that benefits you even if it is stolen. 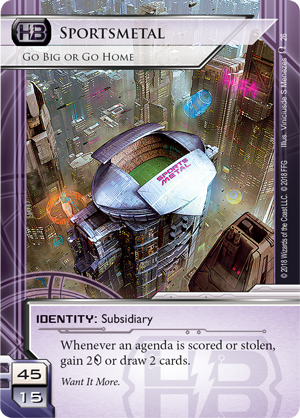 HB even have new ways to mitigate the Runner’s point gains for hijacking your low-cost agendas. 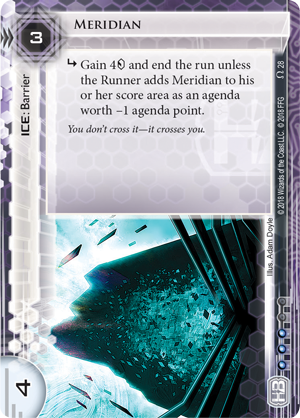 Meridian (Reign and Reverie, 28) is a new barrier with a subroutine that gives the corp four credits and ends the run, unless the Runner adds Meridian to his or her score area as an agenda worth negative agenda points. Either choice is difficult for the runner. Giving HB more credits is a bad idea, but losing agenda points means they have to work that much harder to pull off the big win. 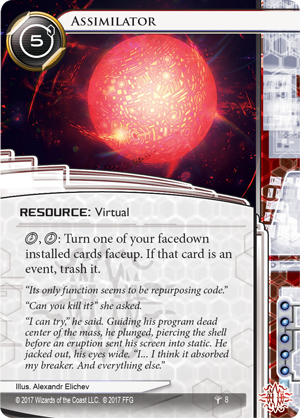 While Android: Netrunner is coming to a close, Reign and Reverie adds one final injection of change into the card pool. 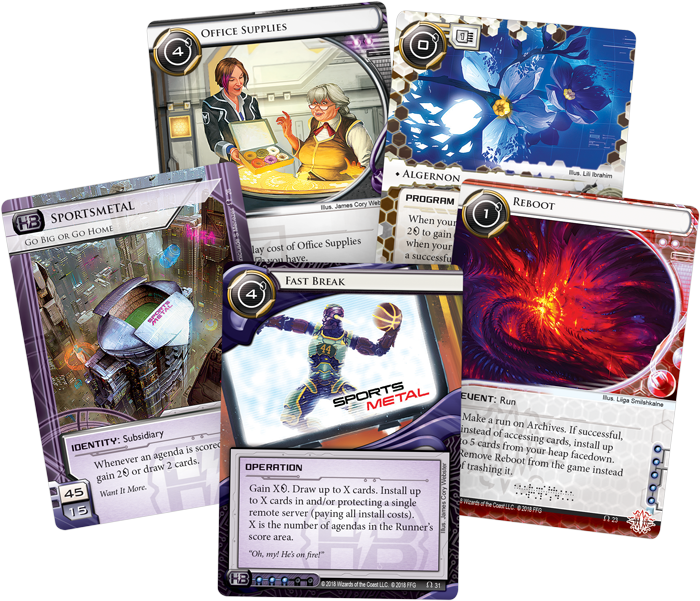 A celebration of Android: Netrunner, these new tools provide players with one simple message. Always be running. 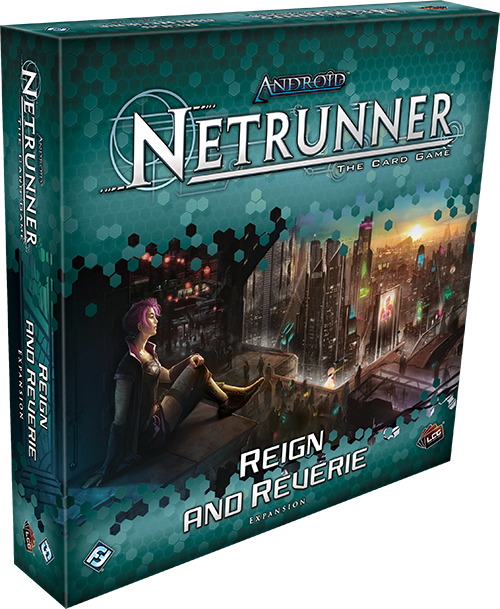 Celebrate Android: Netrunner with Reign and Reverie (ADN56), available now!